Voltage-gated calcium channel (Cav)2.2 (N-type calcium channels) are key components in nociceptive transmission pathways. Ziconotide, a state-independent peptide inhibitor of Cav2.2 channels, is efficacious in treating refractory pain but exhibits a narrow therapeutic window and must be administered intrathecally. We have discovered an N-triazole oxindole, (3R)-5-(3-chloro-4-fluorophenyl)-3-methyl-3-(pyrimidin-5-ylmethyl)-1-(1H-1,2,4-triazol-3-yl)-1,3-dihydro-2H-indol-2-one (TROX-1), as a small-molecule, state-dependent blocker of Cav2 channels, and we investigated the therapeutic advantages of this compound for analgesia. TROX-1 preferentially inhibited potassium-triggered calcium influx through recombinant Cav2.2 channels under depolarized conditions (IC50 = 0.27 μM) compared with hyperpolarized conditions (IC50 > 20 μM). In rat dorsal root ganglion (DRG) neurons, TROX-1 inhibited ω-conotoxin GVIA-sensitive calcium currents (Cav2.2 channel currents), with greater potency under depolarized conditions (IC50 = 0.4 μM) than under hyperpolarized conditions (IC50 = 2.6 μM), indicating state-dependent Cav2.2 channel block of native as well as recombinant channels. TROX-1 fully blocked calcium influx mediated by a mixture of Cav2 channels in calcium imaging experiments in rat DRG neurons, indicating additional block of all Cav2 family channels. 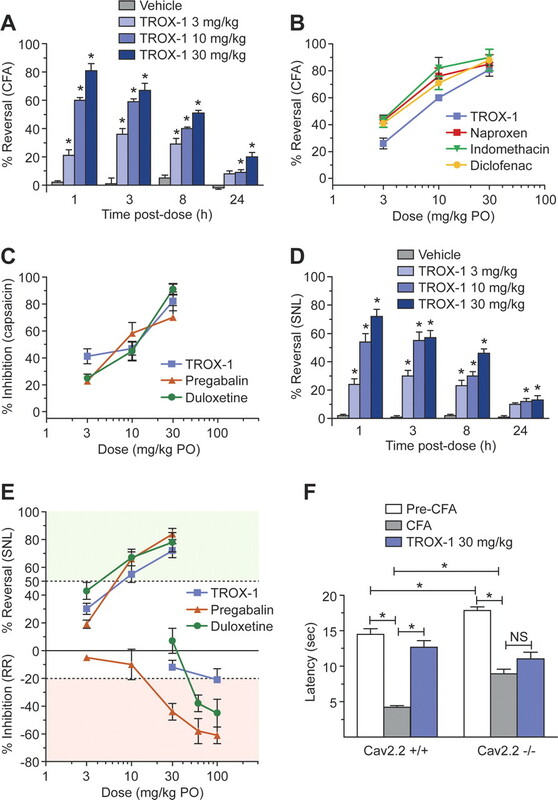 TROX-1 reversed inflammatory-induced hyperalgesia with maximal effects equivalent to nonsteroidal anti-inflammatory drugs, and it reversed nerve injury-induced allodynia to the same extent as pregabalin and duloxetine. In contrast, no significant reversal of hyperalgesia was observed in Cav2.2 gene-deleted mice. Mild impairment of motor function in the Rotarod test and cardiovascular functions were observed at 20- to 40-fold higher plasma concentrations than required for analgesic activities. TROX-1 demonstrates that an orally available state-dependent Cav2 channel blocker may achieve a therapeutic window suitable for the treatment of chronic pain. Inflammatory diseases and neuropathic insults are frequently accompanied by severe debilitating pain, which can become chronic and unresponsive to conventional analgesic treatments. Intrathecal administration of conventional agents, including morphine, may be required in more severe instances. Despite these aggressive treatment efforts, some patients remain refractory. A further intrathecal option is ziconotide, which is a synthetic peptide based on ω-conotoxin MVIIA (MVIIA) that selectively blocks neuronal-type (N-type) voltage-gated calcium channels. Intrathecal ziconotide has been approved for the management of chronic intractable pain, establishing block of N-type channels as the first new, proven mechanism for the treatment of chronic pain in many years (Miljanich, 2004). N-type channels are encoded by the Cav2.2 calcium channel α1 subunit and are largely restricted to the central and peripheral nervous systems (Dubel et al., 1992; Williams et al., 1992). Mapping studies reveal that N-type channels are located at key convergence points for nociceptive input to the central nervous system (CNS) on primary afferent terminals of sensory neurons in the superficial laminae of the dorsal horn (Westenbroek et al., 1998). The physiological roles of Cav2.2 channels have been investigated by using a family of blocking polypeptides derived from the venom of marine cone snails, including ω-conotoxins MVIIA and GVIA (Olivera et al., 1994). Voltage-dependent opening of presynaptic Cav2.2 channels at primary afferent terminals allows the influx of extracellular Ca2+ ions, and this results in the release of glutamate, substance P, and calcitonin gene-related peptide from intracellular vesicles into the neuronal synapse. In this way, voltage-dependent Ca2+ entry directly modulates nociceptive input (Evans et al., 1996). In some pain states, expression of Cav2.2 channels is up-regulated, suggesting an enhanced role for these channels in sensory signaling in chronic pain (Cizkova et al., 2002). Spinal administration of Cav2.2 blocking conopeptides profoundly attenuates hyperalgesia and allodynia resulting from nerve injury or inflammation in preclinical behavioral models of chronic pain (Malmberg and Yaksh, 1995; Scott et al., 2002). In addition, three separate strains of Cav2.2 gene knockout mice display reduced sensitivity to painful stimuli (Cao, 2006). Ziconotide use is limited both by the method of delivery and a narrow therapeutic window between analgesic efficacy and side effects (Miljanich, 2004). As a state-independent Cav2.2 blocker, ziconotide inhibits these channels under most conditions of electrical excitability, which may underlie the small therapeutic window (Winquist et al., 2005). In the present study, we report the discovery of the N-triazole oxindole TROX-1, a potent and state-dependent blocker of Cav2 channels (Cav2.1, Cav2.2, and Cav2.3). TROX-1 efficacy was compared with that of drugs approved for inflammatory pain (nonsteroidal anti-inflammatory drugs) and neuropathic pain (pregabalin and duloxetine), and it was shown to reduce nociception in preclinical pain models, while sparing normal cardiac and behavioral functions. However, TROX-1 afforded diminished efficacy in Cav2.2(−/−) mice, indicating that the analgesic activity of TROX-1 is primarily due to block of Cav2.2. These studies support the notion that an orally administered, state-dependent Cav2 blocker may have therapeutic utility in the treatment of chronic, severe pain. TROX-1 (Fig. 1) was synthesized at Merck Research Laboratories, Rahway, NJ. TROX-1 was diluted in Imwitor 742/Tween 80 (1:1) for oral administration and in a mixture containing N-N-dimethylacetamide (DMA) and polyethylene glycol (PEG) 200 [DMA/PEG200/water (40:40:20)] for intravenous administration. Naproxen, indomethacin, and diclofenac (Sigma-Aldrich, St. Louis, MO) were diluted in 0.5% methylcellulose (Sigma-Aldrich) in water. Pregabalin and duloxetine (Sigma-Aldrich) were diluted in water. Ziconotide, sodium nitroprusside, and phenylephrine (Sigma-Aldrich) were diluted in saline for intravenous administration. Isradipine, ω-conotoxin GVIA, ω-agatoxin IVA, and the peptide SNX-482 (Newcomb et al., 1998) were also obtained from Sigma-Aldrich. State-dependent block of Cav2.2 channels by TROX-1. TROX-1 preferentially blocked recombinant Cav2.2 channels under depolarized conditions (A) compared with hyperpolarized conditions (B) in a fluorescent calcium influx assay. Block of Cav2.2 channels in rat dorsal root ganglion neurons in electrophysiological experiments is shown in C. TROX-1 preferentially blocks channels at depolarized membrane potentials (−50 to −70 mV; circles) compared with hyperpolarized potentials (−100 mV; squares). Representative currents displaying block by 3 μM TROX-1 at depolarized and hyperpolarized potentials are shown at right for two cells. In most studies, male Sprague-Dawley rats were used (220–350 g; Charles River Laboratories, Inc., Wilmington, MA). For the neuropathic pain models, Sprague-Dawley rats were purchased from Harlan (Indianapolis, IN). Cav2.2-deficient mice (described in Kim et al., 2001) were bred by Taconic Farms (Hudson, NY). The procedures used in these studies were approved by the Institutional Animal Care and Use Committee at Merck Research Laboratories (Rahway, NJ) and adhere to the guidelines of the Committee for Research and Ethical Issues. A fluorescent assay was used to measure compound-mediated inhibition of calcium influx with a calcium-sensitive florescent dye on a FLIPR Tetra instrument (Molecular Devices, Sunnyvale, CA). The assay is similar to that described previously (Dai et al., 2008) except that a different Cav2.2 cell line (labeled CBK) was used in the present work. CBK cells express three calcium channel subunits (α1B-1, α2-δ, and β3a) along with an inwardly rectifying potassium channel (Kir2.3) that enabled the cell membrane potential to be controlled by bath potassium concentration. Incubation of CBK cells in elevated potassium solution leads to depolarization of cell membrane potential. Exposing CBK cells to modestly elevated concentrations (30 mM) of potassium caused partial inactivation of the Cav2.2 channel population. In comparison, incubating cells in a bath solution containing 4 mM potassium maintained a negative membrane potential (−90 mV), at which voltage most Cav2.2 channels are in resting conformations. After compound incubation in 4 or 30 mM potassium, to evaluate block of resting and open/inactivated channels, respectively, channel opening was initiated with 1:1 (by volume) addition of 140 mM potassium solution. TROX-1 was tested in quadruplicate, and average ± S.D. values were calculated for 10 point titrations (0.001–30 μM). Dorsal root ganglia (DRG) were dissected from 4- to 12-week-old rats. Dissected ganglia from L4 to L6 were desheathed in ice-cold minimal essential medium (Mediatech, Herndon, VA) and incubated in minimal essential medium containing 0.125% collagenase (type I) for 45 to 60 min at 37°C, followed by 0.05% trypsin for 10 min at 37°C. The ganglia were then washed in F-14 growth media, consisting of 10% F-14, 10% horse serum, 1% penicillin/streptomycin (5000 IU/500 μg), and 0.12% NaHCO3, and then they were triturated with a fire-polished pipette to obtain a suspension with single cells. Cells were then maintained on a slow rotator for up to 6 h until use. Membrane currents were recorded using the whole-cell patch-clamp technique with a EPC 10 patch-clamp amplifier (HEKA, Port Washington, NY). Fire-polished patch electrodes had resistances from 1 to 3 megaohms when filled with internal solution containing 130 mM CsCl, 2.7 mM MgCl2, 9 mM EGTA, 9 mM HEPES, 4 mM MgATP, 0.3 mM GTP(Tris), and 14 mM phosphocreatine(Tris). External recording solution contained 150 mM triethylammonium chloride, 5 mM BaCl2, 0.5 mM MgCl2, 10 mM HEPES, and 10 mM glucose, pH 7.3, with triethylammonium hydroxide. Currents were leak-subtracted using a standard p/4 subtraction protocol. To minimize the contribution of other non–Cav2.2 calcium channels present in DRG neurons, 100 nM isradipine, 300 nM agatoxin IVA, and 150 nM SNX-482 were added to the external solution. The standard voltage protocol consisted of a 100-ms prepulse to −50 mV to inactivate T-type channels followed by a 50-ms step to +10 mV, repeated once every 15 s, to activate Cav2.2 channels. Cells were first voltage-clamped at a holding membrane potential of −90 mV. After a stable baseline was obtained, the holding potential was then stepped to either a more positive potential (−50 to −70 mV for ∼30% channel inactivation) to measure Cav2.2 inhibition from a depolarized state, or to a more negative potential of −100 mV to estimate closed state block. When a stable baseline was achieved at the new holding potential, compound was applied by bath perfusion until steady-state block was achieved. Peak currents were measured and the percentage of inhibition was calculated using the current amplitude in 100 μM CdCl2 (applied at the end of the experiment) as the baseline. Neonatal rat DRG neurons purchased from Lonza Walkersville, Inc. (Walkersville, MD) were grown on glass coverslips according to the manufacturer's instructions. The DRG neurons were loaded with 2 μM fura-2/acetoxymethyl ester dye for 30 min at room temperature and then perfused with a solution containing 136 mM NaCl, 14 mM KCl, 1.8 mM CaCl2, 0.5 mM MgCl2, 10 mM glucose, and 10 mM HEPES, pH 7.2. Isradipine (100 nM) was added to all solutions to remove any contribution of L-type, Cav1 channels. Images were collected with a TE200 inverted microscope (Nikon, Tokyo, Japan) equipped with a 40× S Fluor oil immersion objective (1.3 numerical aperture), an Orca-ER digital camera (Hamamatsu, Bridgewater, NJ), and a DG4 filter changer (Sutter Instrument Company, Novato, CA). The fura-2 was excited at 340 and 380 nm, and fluorescence emission at 510 ± 20 nm was captured. To trigger Cav channel opening, the bath solution was changed for 2 min to high potassium solution containing 72 mM KCl, 78 mM NaCl, 1.8 mM CaCl2, 0.5 mM MgCl2, 10 mM glucose, and 10 mM HEPES (pH 7.2 with NaOH), supplemented with 100 nM isradipine. The average fluorescence intensity ratio (R) in each cell body (F340/F380) was measured over time, and the change in R (ΔR) for a potassium challenge was calculated by determining the peak R in high potassium and subtracting the baseline R just before potassium addition. Under these conditions, control experiments established that the DRG calcium signal was stable for up to 2 h. On average, the calcium transient was 102 ± 3% (n = 13) of the initial response after >100 min of control perfusion. Compound was added to cells for 20 min before potassium challenge, and the fraction block was calculated from the equation 1 − (ΔRDrug/ΔRControl). The IC50 for block of ΔR was calculated from a fit to a standard Hill equation. Values are reported as mean ± S.E. To test the sensitivity of the DRG calcium signal to Cav2 block, the following protocol was used. After a single control stimulus, selective peptide inhibitors of Cav2.2 (ω-conotoxin GVIA; 600 nM), Cav2.1 (ω-agatoxin IVA; 300 nM), and Cav2.3 (SNX-482; 300 nM) were applied alone or in combination for >20 min before a second K+ stimulus and then the percentage of inhibition was calculated. Membrane vesicles were prepared from rat lumbar spinal cords (Kuwayama and Kanazawa, 1982). Spinal cords (L4–L6) were removed and divided bilaterally in two hemisections ipsilateral and contralateral to a hind paw injected with complete Freund's adjuvant (CFA). In each experiment, sections from four to eight animals were pooled, and membrane vesicles from ipsilateral and contralateral sides were prepared in parallel. Conotoxin binding was performed according to Feigenbaum et al. (1988). Samples were incubated overnight in 5 ml of sample buffer containing 50 mM Tris-HCl, pH 7.4, 20 mM NaCl, and 1 g/l bovine serum albumin (Fraction V) and increasing concentrations of 125I-CgTX GVIA (2200 Ci/mmol; PerkinElmer Life and Analytical Sciences, Boston, MA). Nonspecific binding levels were determined in the presence of 67 nM GVIA. Samples were diluted with 4 ml of ice-cold wash buffer containing 20 mM Tris-HCl, pH 7.4, 30 mM NaCl, and 0.06% bovine serum albumin, and then they were poured onto GFC filters preincubated for 15 min in 0.5% polyethylenimine for vacuum filtration. Filters were then washed twice with ice-cold wash buffer. Radioactivity associated with the filters was determined in a Cobra gamma-radiation counter (PerkinElmer Life and Analytical Sciences). Binding values were normalized to protein concentrations using a commercially available protein assay (BCA Protein Assay Kit; Pierce Chemical, Rockford, IL). The 125I-CgTX GVIA binding site densities for each membrane preparation were determined in saturation binding experiments repeated two or three times for each membrane preparation, with close agreement between replicate measurements (average coefficient of variation = 10.6%). The relative changes were averaged from six repeated experiments testing the effects of CFA treatment on 125I-CgTX GVIA binding site density. In vitro binding assay screening for a panel of 166 ancillary targets was performed by MDS Pharma Services (King of Prussia, PA). TROX-1 was evaluated in well characterized in vivo models to assess acute, inflammatory, and neuropathic pain. Animals were randomly assigned to each treatment group. Results are presented as mean ± S.E.M. Percentage of reversal is calculated as (postdose − predose)/(preinjury − predose) × 100 for each rat; 100% corresponds to complete reversal of hyperalgesia or allodynia, equivalent to noninjured values, and 0% corresponds to values not different from baseline postinjury. Results were analyzed using a two-way analysis of variance (for dose and time after dose) test followed by a Bonferroni post-tests for multiple comparisons (Prism; GraphPad Software Inc., San Diego, CA). ED50 values were calculated as doses corresponding to a 50% effect (100% effect corresponding to recovery to baseline values in the absence of injury). Unless otherwise noted, all experimental and control groups contained at least six animals per group. For the inflammatory pain model, rats were injected with 200 μl of CFA, 1:1 in saline (Sigma-Aldrich) intraplantarly into their left paw (Colpaert, 1987). Animals were tested for hyperalgesia 3 days after CFA administration, using withdrawal threshold to paw pressure (Randall-Selitto paw-withdrawal test; Stoelting Co., Wood Dale, IL). To investigate whether the antihyperalgesic effect of TROX-1 was observed upon repeated dosing, the compound was administered for 3 days at 10 mg/kg q.d. in the CFA model of hyperalgesia. Reversal of mechanical hyperalgesia was assessed 3 h after dose on days 1, 2 and 3. Naproxen, indomethacin, and diclofenac (3–30 mg/kg p.o.) were included as a positive control. For the neuropathic pain model (spinal nerve ligation; SNL), rats were anesthetized with isoflurane and then were placed on a heating pad. Using aseptic techniques, the L5 spinal nerve was exposed, ligated, and transected (Kim and Chung, 1992). Muscle and skin were closed with 4-0 Polydiaxone and wound clips, respectively. Allodynia was assessed 4 weeks after SNL surgery, and only rats that developed allodynia as defined by a significant decrease in their mechanical threshold using von Frey filaments were used. Tactile allodynia was assessed with calibrated von Frey filaments (Stoelting Co.), using an up-down paradigm (Chaplan et al., 1994). Pregabalin and duloxetine (3–30 mg/kg p.o.) were included as positive controls. For the capsaicin-induced secondary allodynia model, rats were administered with capsaicin intradermally [30 μg in 10 μl, in ethanol/Tween 80/0.9% saline (20:7:73)] 1 h after dose, and mechanical allodynia using von Frey filaments was assessed 30 min and 1 and 2 h after capsaicin. Percentage of inhibition of allodynia was calculated as (postdrug − postcapsaicin)/(precapsaicin − postcapsaicin) × 100, where 100% is equivalent to complete reversal of allodynia, i.e., precapsaicin value. In the rat model of osteoarthritis, iodoacetate (IOA; 2 mg/25 μl per rat in pH 7.4 saline; Sigma-Aldrich) was administered under brief isoflurane anesthesia into the rat left knee joint, and hypersensitivity to von Frey filaments and changes in weight bearing were assessed 6 weeks post-IOA administration. Percentage of reversal of hypersensitivity was calculated as (postdrug − post-IOA injection)/(pre-IOA injection − post-IOA injection) × 100, where 100% is equivalent to complete reversal of hypersensitivity, i.e., pre-IOA injection value. Percentage of reversal of changes in weight bearing was calculated as (postdrug − post-IOA injection)/(pre-IOA injection − post-IOA injection) × 100, where 100% is equivalent to complete reversal of changes in weight bearing, i.e., pre-IOA injection value. For the hot-plate model of acute nociception, male Sprague-Dawley rats (170–260 g; n = 5/group; Charles River Laboratories, Inc.) were used. Latency time on a hot-plate was assessed at 56°C. Two baseline values 10 min apart were taken before compound administration. Rats were tested 1 and 3 h after compound administration for changes in latency time. For motor coordination assessment, rats were trained on the Rotarod (Stoelting Co.) for 3 min at 10 rpm. For testing, the speed was set at 10 rpm for 60 s and subsequently accelerated to 60 rpm. The time taken for rats to fall after the beginning of the acceleration was recorded. For mouse CFA studies, male mice (Taconic Farms) received a unilateral a 20-μl intraplantar injection of CFA (0.5 mg/ml; Sigma-Aldrich) into the left paw. Thermal hyperalgesia (Hargreaves apparatus) was assessed 1 day post-CFA. Mice were habituated to the Hargreaves apparatus for 1 h per day for 3 days before testing. Thermal sensitivity was assessed by measuring paw withdrawal latencies to a radiant heat stimulus. Mice deficient for Cav2.2 were initially characterized by Kim et al. (2001). Rats were surgically implanted with cannulae (polyethylene-50 tubing) in the left femoral artery and vein under aseptic conditions for the measurement of mean arterial pressure (MAP) and heart rate (HR) and administration of test agents, respectively. After 24 h, the arterial catheter was connected to a DTX pressure transducer (BD Biosciences, Franklin Lakes, NJ), which in turn fed into a universal signal conditioner (Data Sciences International, St. Paul, MN). The pressure signals were digitized and recorded on a computer using the Ponemah data acquisition software (Data Sciences International). The recorded data were reviewed offline, and the MAP and HR were derived by the software for data analysis. While animals were fully conscious and moving freely in their cages, sodium nitroprusside (SNP) or phenylephrine (PE) was administered as a bolus injection through the venous catheter to evoke changes in arterial pressure and baroreflex activity. A jugular catheter had to be placed for the administration of SNP and PE if the femoral vein catheter was occupied for administering test agent via a continuous infusion. A change of MAP from lowest to highest readings by at least 100 mm Hg was achieved by means of varying the doses of SNP from 8 to 32 μg/kg and of PE from 8 to 16 μg/kg. This was to ensure evaluation of the full range of baroreflex activities. SNP and PE were prepared daily in saline at 100 μg/ml and diluted to a final volume of 0.1 ml upon administration. The responses to SNP and PE in MAP and HR, averaged every second per data point, were plotted to fit a sigmoid function to establish the baroreflex function curve. The equation was described as HR = P1 + P2/[1 + eP3(MAP-P4)], where P1 is low plateau of HR, P2 is HR range (difference between high and low plateaus), P3 is a curvature coefficient that is independent of HR range, and P4 is the median blood pressure (BP50; mm Hg) at the point halfway between high and low HR plateaus. The average gain (G) or slope of the curve between the two inflection points is given by G = −P2 × P3/4.56 (Leppard et al., 1979). To evaluate the effect of TROX-1 on baroreflex function, baseline baroreflex was characterized first at control condition as described above. Animals were then divided into three groups (n = 5 each) and treated with TROX-1 at 0.1, 0.3, and 1 mg/kg/min, respectively, via a 30-min intravenous infusion. Baroreflex evaluation was repeated at the end of the treatment and compared with that at control condition. Blood samples were taken after baroreflex function was measured to determine the plasma levels of the compound. An additional group of four rats was treated with vehicle [DMA/PEG200/water (2:2:1)] at matching volume and rate as control. To compare TROX-1 with a peptidyl Cav2.2 channel blocker, two groups of four rats were treated with GVIA at 1 and 3 μg/kg, respectively, administered as an intravenous bolus. Baroreflex function was measured before and 30 min after the toxin treatment. A third group of three rats was treated with saline as vehicle control. TROX-1 was administered intravenously to three anesthetized, vagotomized dogs during three sequential 30-min periods at rising doses of 1, 2, and 7 mg/kg (cumulative dose 1, 3, and 10 mg/kg), in 50% dimethyl sulfoxide/50% polyethylene glycol 200 (v/v) to determine the effect of the compound on cardiovascular function. Dogs were anesthetized with sodium pentobarbital for the duration of the study. The right femoral artery and vein were cannulated for the measurement of mean arterial pressure and for maintenance of anesthesia, respectively. The left femoral vein was cannulated for intravenous compound administration. Effects were compared with those of vehicle alone administered in a separate set of four dogs. MAP, HR, and electrocardiographic parameters (PR, QRS, and QT/QTc intervals) were monitored predose and during each 30-min infusion. Blood was withdrawn at 29 min after the beginning of each infusion interval, collected in lithium heparin on ice, and centrifuged; the plasma fraction removed and frozen (−70°C). Plasma and homogenized brain tissue concentrations of TROX-1 were determined by liquid chromatography-tandem mass spectrometry using an ABI Sciex API 3000 mass spectrometer (Applied Biosystems/MDS Sciex, Foster City, CA) operated in positive ion atmospheric pressure chemical ionization mode with multiple-reaction monitoring. Plasma and homogenized brain tissue were prepared for analysis by protein precipitation with acetonitrile. Extracts were chromatographed using a Zorbax SB-C8 column (50 × 2 mm, 5 μm; DuPont, Wilmington, DE) and eluted at 0.2 ml/min under isocratic conditions with acetonitrile/water (77:23) containing 5 mM ammonium formate/0.1% formic acid. TROX-1 Blocks Cav2.2 Channels in a State-Dependent Manner. TROX-1 (Fig. 1) was identified as a state-dependent Cav2.2 N-type channel blocker using the fluorescent calcium influx assay. TROX-1 caused concentration-dependent inhibition of the calcium influx signal and inhibited channel activity more effectively in recombinant cells under conditions in which the cells were depolarized (30 mM bath potassium; IC50 = 0.27 ± 0.13 μM; n = 8) than when cells were hyperpolarized (4 mM bath potassium; IC50 > 10 μM; n = 4). In the representative experiment shown in Fig. 1, the IC50 value for Cav2.2 inhibition under depolarized conditions (0.25 μM; Fig. 1A) was approximately 100-fold lower than for channel inhibition under hyperpolarized conditions (∼28 μM; Fig. 1B). The amplitude of the peak calcium influx signal is smaller in Fig. 1A (30 mM K+) than in Fig. 1B (4 mM K+) due to inactivation of a fraction of the Cav2.2 channels. TROX-1 Inhibits Cav2.2 Channels in Isolated DRG Neurons. Calcium channel currents in rat DRG neurons were recorded in electrophysiology experiments with barium as the charge carrier. Contributions from non–Cav2.2 calcium channels were minimized by using a mixture of pharmacological blockers and voltage prepulses. The average current inhibited by 600 nM GVIA after minimizing non–Cav2.2 currents was 85 ± 1% (n = 4) from depolarized holding potentials and 82 ± 1% (n = 4) from hyperpolarized holding potentials. When cells were depolarized to obtain an ∼30% inactivation of Cav current (Vhold = −50 to −70 mV), 300 nM TROX-1 inhibited 47 ± 2% (n = 5) and 1 μM TROX-1 inhibited 69 ± 4% (n = 3) of the DRG barium current. Consistent with a state-dependent blocker, when cells were held hyperpolarized (Vhold = −100 mV) to minimize open/inactivated state block, 1 μM TROX-1 inhibited only 28 ± 3% (n = 5) and 3 μM TROX-1 inhibited 54 ± 6% (n = 4) of the DRG barium current. A Hill fit of data from an expanded titration of TROX-1 yielded an estimated IC50 value of 0.4 μM for the depolarized inhibition and 2.6 μM for the hyperpolarized inhibition (Fig. 1C ). As a measure of the functional effects of TROX-1 on other Cav2 channels in rat DRG neurons, fura-2 calcium imaging of neonatal DRGs was performed. To detect state-dependent Cav channel block, DRGs were bathed in an elevated potassium solution (14 mM) to modestly depolarize the membrane (Vm ≅ −58 mV). Isradipine (100 nM) was added to all solutions to remove any contribution of Cav1 (L-type) channels. Under these conditions, studies with individual toxins and paired combinations suggest that Cav2.2 channels contribute significantly to the overall signal (Table 1). However, the peak Ca2+ transient triggered by application of 72 mM potassium solution was inhibited to the greatest extent by a combination of GVIA, ω-agatoxin IVA, and SNX-482, which selectively block Cav2.2, Cav2.1 (P/Q-type), and Cav2.3 (R-type) channels, respectively (81% block in the representative experiment in Fig. 2A) (Doering and Zamponi, 2003). These results suggest that the calcium rise was driven by the opening of multiple Cav2 channel subtypes. TROX-1 dose-dependently reduced the Ca2+ transient (Fig. 2B ), with an estimated IC50 value of 2.1 μM (Fig. 2C), and it blocked nearly all the signal at maximal TROX-1 concentrations. TROX-1 block of Cav2 family channels in rat DRG neurons measured with calcium imaging. Calcium influx was initiated by elevation of bath potassium concentration from 14 to 72 mM for 2 min (triangles). Peak calcium signals were blocked by a combination of GVIA, ω-agatoxin IVA, and SNX-482 (81%; A). TROX-1 reversibly and fully inhibited the peak calcium signals in a single DRG neuron (B). A dose-response curve was constructed from average responses in eight neurons from four experiments and is plotted in C. Solid line represents a fit to the data using a Hill equation, with an IC50 value of 2.1 μM, a Hill slope of 1.1, and a maximal inhibition of 0.99. 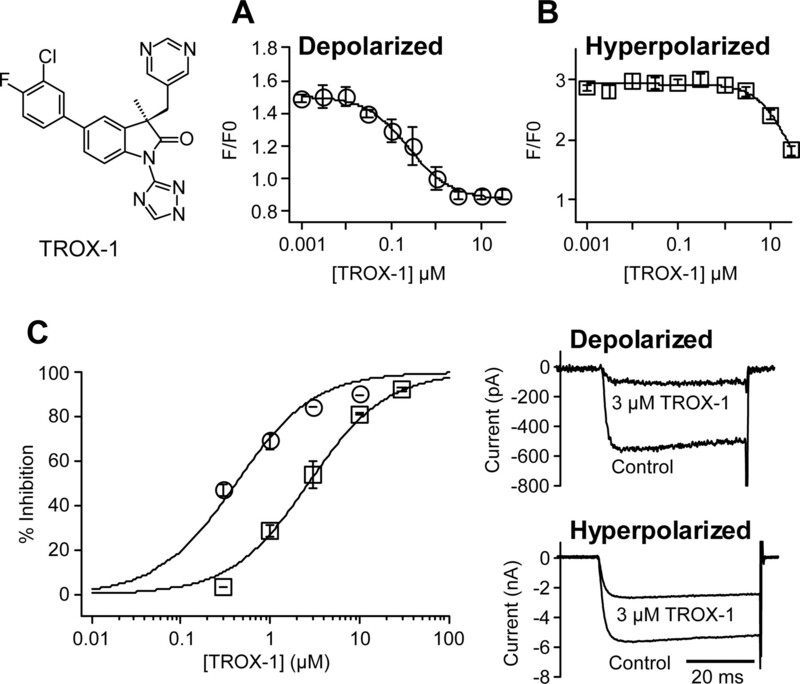 TROX-1 Selectively Inhibits Cav2 Channels over Ancillary Targets. Block of Cav1.2 (L-type) channels and Cav3.1 and Cav3.2 (T-type) channels was determined in similar fluorescent calcium influx assays (Table 2). TROX-1 displayed weak block of these calcium channel subtypes compared with block of Cav2.2. TROX-1 afforded selectivity for Cav2.2 over sodium channel targets relevant to analgesia, including Nav1.7 and Nav1.8, in voltage-based fluorescent assays. TROX-1 was also selective over cardiac ion channels in electrophysiological experiments, with weak block of Nav1.5, Ikr, and Iks. In an additional screen of 166 targets, 10 μM TROX-1 exhibited activity (>50% inhibition) in only three binding assays. TROX-1 was active in the adrenergic α2A binding assay, with an IC50 value of 8.2 μM. In a subsequent guanosine 5′-O-(3-thio)triphosphate functional assay for α2A activity, TROX-1 exhibited no agonist activity and weak antagonist activity, with maximal 35% functional inhibition at 10 μM. TROX-1 was also active in the serotonin 5-hydroxytryptamine6 binding assay, with an IC50 value of 8.8 μM. In a subsequent cAMP functional assay for 5-hydroxytryptamine6 activity, the compound exhibited no agonist activity and weak antagonist activity, with maximal 49% functional inhibition at 10 μM. Finally, TROX-1 was active as an inhibitor of phosphodiesterase 4, with an IC50 value of 7.6 μM. In rats, TROX-1 afforded good bioavailability (F = 89%) after oral administration of 3 mg/kg, with a Cmax value of 2.1 μM obtained 0.8 h after dose (Tmax). After an intravenous dose of 1 mg/kg, TROX-1 exhibited a moderate plasma clearance rate of 13 ml/min/kg and with a half-life of 2.2 h. With oral administration, TROX-1 plasma exposure increased in a dose-proportional manner between 1 and 100 mg/kg. Furthermore, TROX-1 was found to be brain-penetrant, with similar compound concentrations found in homogenized brain and plasma at all doses and times examined. Spinal Cav2.2 Density Increase Ipsilateral to Injury. Inflammatory pain was induced by intraplantar injection of CFA into a single hind paw of rats. Three days after CFA injection, a significant 32 ± 14% (mean ± S.D. 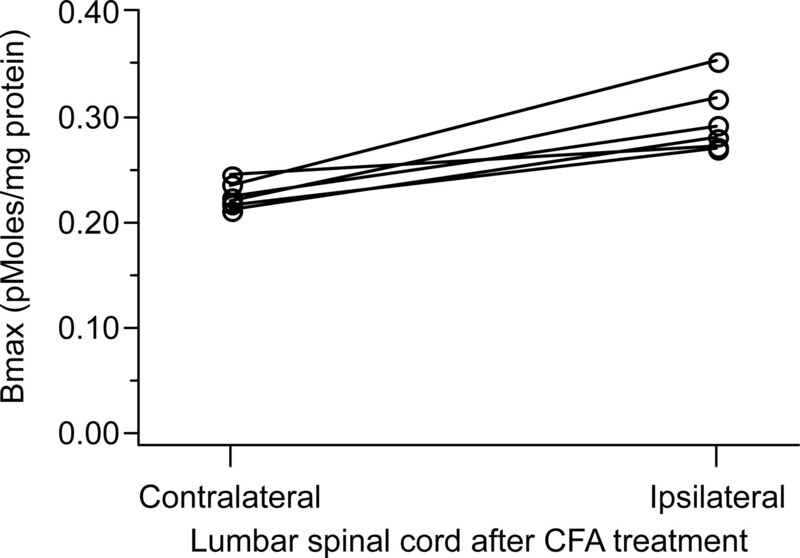 ; n = 6 experiments) increase in 125I-CgTX GVIA binding was observed in the rat spinal cord (L4–L6 membrane vesicles) ipsilateral to CFA treatment compared with the contralateral side (Fig. 3). The site densities increased from 0.225 ± 0.013 pmol/mg protein on the contralateral sides to 0.297 ± 0.032 pmol/mg protein on the ipsilateral sides. These differences were significant at the p < 0.01 level as assessed by the paired t test. 125I-CgTX GVIA binding site density in rat lumbar spinal cord segments. Comparison of CFA-induced 25I-CgTX GVIA binding in rat lumbar membrane vesicles ipsilateral to CFA treatment compared with the contralateral side. Connected symbols are from individual experiments. TROX-1 was evaluated after oral administration in standard rodent models of chronic pain and its antinociceptive activity was compared with analgesics currently used therapeutically. In the rat CFA model, a single dose of either TROX-1, vehicle, or a nonsteroidal anti-inflammatory drug was administered, and mechanical hyperalgesia was assessed at 1, 3, 8, and 24 h after dose. TROX-1 dose-dependently reversed CFA-induced hyperalgesia (Fig. 4A), with a maximal effect of 81% reversal (100% corresponding to noninflamed condition) at 30 mg/kg, and a duration of action greater than 8 h after dose at 3 mg/kg. The magnitude of efficacy of TROX-1 at the 1-h time point was equivalent to analgesics used for inflammatory pain, such as naproxen, diclofenac, or indomethacin (Fig. 4B). Analgesic activity of TROX-1 in rodent pain models. In the rat CFA-induced hyperalgesia model (A and B), TROX-1 dose-dependently reversed CFA-induced hyperalgesia with a duration of action greater than 8 h after dose (A). Antihyperalgesic effects of TROX-1 and standard analgesics at 1 h after dose in the rat CFA model, expressed as percentage of reversal of hyperalgesia calculated as indicated under Materials and Methods (B). TROX-1 inhibited rat capsaicin-induced secondary allodynia similar to pregabalin and duloxetine at 1 h after dose (C). TROX-1 dose-dependently reversed rat SNL-induced allodynia, with a duration of action greater than 8 h after dose (D), and its antiallodynic properties were comparable with that of pregabalin or duloxetine at 1 h after dose (E). The compounds used for neuropathic pain in SNL model versus Rotarod model of motor coordination were compared with TROX-1 (E). Pregabalin and duloxetine induced significant impairment of motor coordination (>20%) at lower doses than TROX-1, as represented by the region in red. Mice deficient for Cav2.2 showed greater thermal threshold both in the absence of inflammation (pre-CFA) and 1 day after intradermal CFA administration compared with wild-type mice (F). At 1 h after dose, TROX-1 significantly reversed CFA-induced hyperalgesia in wild-type mice (88% reversal; F) but not in Cav2.2-deficient mice (31% reversal; F). Significance (n ≥ 6/group) was calculated using a two-way ANOVA followed by Bonferroni post hoc tests for multiple comparisons with “vehicle” values (∗, p < 0.05). Sustained reversal of rat CFA-induced hyperalgesia was observed after chronic administration of TROX-1 (Fig. 5). TROX-1 at 3 h after dose induced similar reversal of hyperalgesia on all days (52% on day 1, 57% on day 2, and 58% on day 3). Controls included rats that received vehicle for 2 days and TROX-1 on day 3. The reversal of hyperalgesia was similar after 3 day dosing of TROX-1 (58%) to dosing of TROX-1 only on day 3 (54%). Plasma levels of TROX-1 were measured at 3 h after each dose in this experiment and were found to be 2.76 μM on day 1, 3.65 μM on day 2, and 3.41 μM on day 3. Effects of a 3-day chronic treatment of TROX-1 and naproxen in the CFA-induced hyperalgesia model in rats. Percentage of reversal of hypersensitivity (indicated above bars) was calculated as indicated under Materials and Methods. In the rat capsaicin-induced secondary allodynia model of central sensitization, TROX-1 dose-dependently reversed allodynia to the same magnitude as pregabalin and duloxetine, drugs approved for the treatment of diabetic neuropathy (Fig. 4C ). In the rat SNL model of neuropathic pain, in which compounds are evaluated 4 weeks after ligation, TROX-1 dose-dependently reversed mechanical allodynia (Fig. 4D). Maximal reversal of allodynia (72%) was observed at the 30 mg/kg dose. The magnitude of this effect was similar to that of both pregabalin and duloxetine (Fig. 4E). Estimated ED50 values for TROX-1, pregabalin, and duloxetine in the SNL neuropathic pain model were 8, 7, and 4.5 mg/kg, respectively (Fig. 4E). TROX-1 efficacy was also assessed in rats in the knee intra-articular IOA model of osteoarthritis. TROX-1 reversed IOA-induced allodynia (Fig. 6A): 17, 27, and 49% at 3, 10, and 30 mg/kg, respectively, at 1 h after dose. By comparison, naproxen at 20 mg/kg reversed allodynia by 47% in this assay. TROX-1 also reversed IOA-induced weight-bearing (Fig. 6B): 28, 38, and 43% at 3, 10 and 30 mg/kg, respectively at 1 h after dose. Naproxen administered at 20 mg/kg reversed weight-bearing effects by 42% in this assay. Antihyperalgesic effects of TROX-1 in the rat knee IOA model of inflammatory pain. TROX-1 reversed IOA-induced allodynia (A) and weight-bearing behavior (B) in a dose-dependent manner. 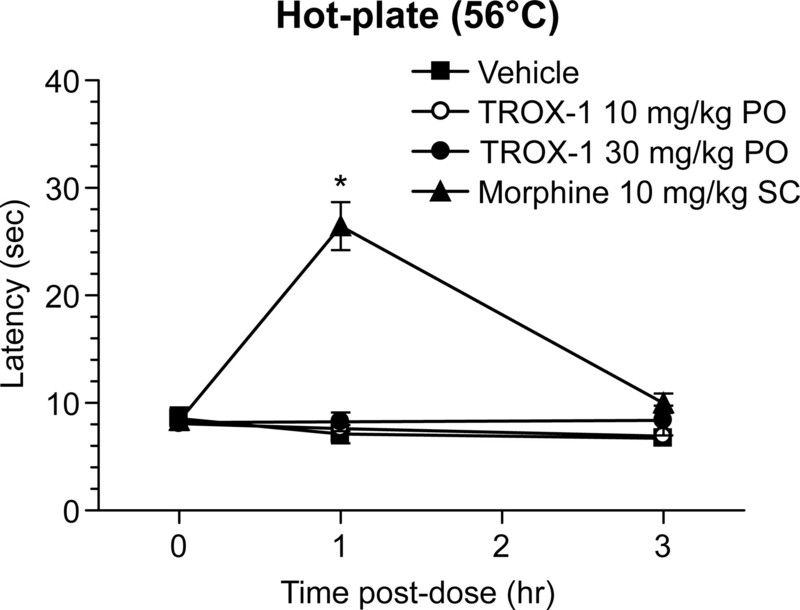 In a model of acute nociception (rat hot-plate at 56°C), TROX-1 administered orally at 10 or 30 mg/kg had no effect on thermal threshold at 1 or 3 h after dose. Morphine administered subcutaneously at 10 mg/kg significantly increased thermal thresholds 1 h after dose (Fig. 7). Effects of TROX-1 and morphine in the rat hot-plate model of acute nociception. Morphine (10 mg/kg) significantly enhanced latency, whereas TROX-1 (10 and 30 mg/kg) was inactive. To assess the contribution of Cav2.2 blockade on the antinociceptive activity of TROX-1 over blockade of related Cav2 channels, we evaluated the compound for the reversal of CFA-induced hypersensitivity to heat in mice lacking only Cav2.2 channels. As reported previously (Kim et al., 2001) we found that Cav2.2-deficient mice showed a significantly greater thermal threshold compared with wild-type mice in the absence of injury (pre-CFA; Fig. 4F). 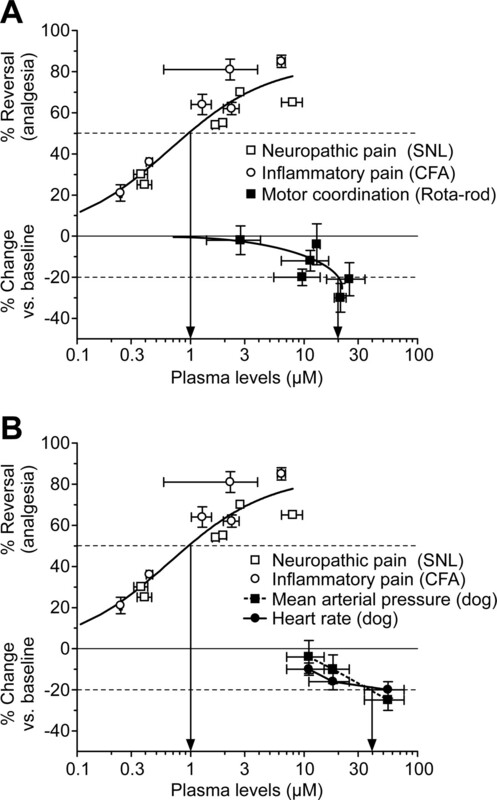 Hypersensitivity to heat was measured in both Cav2.2(+/+) and Cav2.2(−/−) mice given intraplantar injections of CFA to induce inflammatory pain. Cav2.2-deficient mice showed a significant reduction (50 versus 71% decrease in latency) in hyperalgesia compared with control mice (CFA; Fig. 4F). TROX-1 significantly reversed CFA-induced hyperalgesia in wild-type mice (88% reversal) but did not significantly reduce hyperalgesia in Cav2.2-deficient mice (31% reversal; Fig. 4F). TROX-1 In Vivo Side Effect Profile. In the rat Rotarod model of motor coordination, pregabalin and duloxetine induced significant impairment (>20%) of balance at doses greater than 30 mg/kg. At higher dosing (100 mg/kg), pregabalin and duloxetine reduced Rotarod performance by 61 and 45%, respectively (Fig. 4E). In contrast, TROX-1 did not induce detectable motor impairment at 30 mg/kg p.o., although a significant but mild impairment was apparent at 100 mg/kg (21% inhibition compared with baseline). To determine the CNS therapeutic window of TROX-1 and compare it with standard analgesics, we calculated the ratio of Rotarod ED20/SNL ED50. In the Rotarod model, pregabalin and duloxetine ED20 values, corresponding to significant motor coordination impairments, were 15 and 45 mg/kg, respectively (Fig. 4E). Using these criteria and data, the CNS therapeutic window was estimated to be ∼2 for pregabalin and ∼10 for duloxetine (Fig. 4E). Significant motor effects with TROX-1 were only observed at 100 mg/kg, providing an estimated CNS therapeutic window of ∼12.5. The therapeutic window for TROX-1 was also estimated based on plasma exposure achieved in these assays. The EC50 values for TROX-1 in rat pain models were ∼1 μM and Rotarod effects were observed at ∼20 μM, providing a CNS therapeutic window of 20-fold (Fig. 8A). Comparison of the analgesic activity of TROX-1 versus side effect profile. TROX-1 ED50 value in rat models of inflammatory or neuropathic pain was 1 μM. Significant impairment (>20%) of motor coordination in the rat Rotarod assay corresponded to plasma levels of 20 μM (A). Significant canine cardiovascular changes were observed at plasma levels of 40 μM (B). Both TROX-1 and GVIA were evaluated in baroreflex models in conscious rats to determine the potential of these agents to induce orthostatic hypotension. GVIA was initially evaluated for potential hemodynamic effects in conscious rats to help identify dose selection for baroreflex studies. GVIA (1–30 μg/kg i.v.) evoked a modest decrease in HR (∼10%) and a profound decrease in MAP (>30%) at doses of 10 and 30 μg/kg. Accordingly, the maximal dose of GVIA evaluated for effects on baroreflex sensitivity was 3 μg/kg. Baroreflexes were elicited in conscious rats via acute administration of PE to increase MAP, or SNP to decrease MAP, while evaluating the corresponding changes in heart rate. In control animals, baseline MAP was 116 ± 6 mm Hg and HR was 450 ± 11 beats/min. The administration of PE increased MAP to 175 ± 6 mm Hg, with a corresponding decrease in heart rate to 320 ± 11 beats/min, and the administration of SNP decreased MAP to 61 ± 6 mm Hg, with a corresponding increase in heart rate to 531 ± 17 beats/min. From plots of heart rate against MAP, the heart rate range (difference between high and low plateaus) and the rate of change (gain) in heart rate were calculated with respect to changes in MAP, using the sigmoid function described under Materials and Methods. BP50 (mm Hg) was also calculated at the point halfway between the high and low heart rate plateaus, and the values from this curve fit are presented in Table 3. 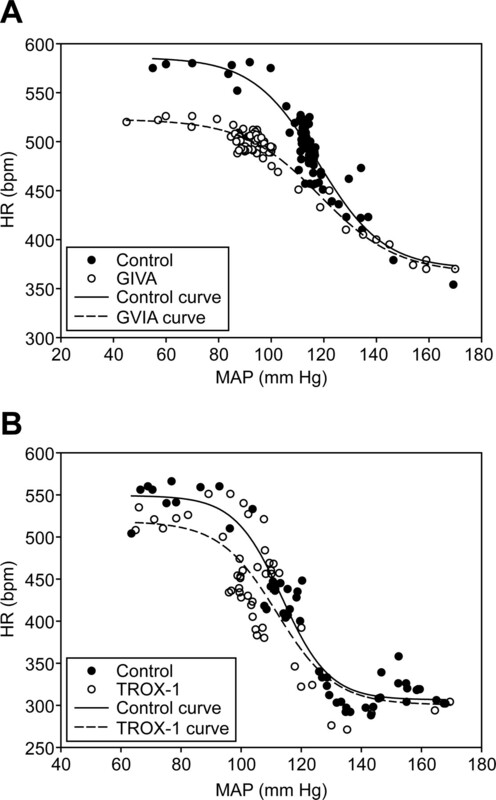 GVIA (3 μg/kg) evoked significant decreases in heart rate range and in the gain function compared with vehicle control (Fig. 9A). In contrast, none of the baroreflex parameters were significantly altered by the infusion of TROX-1 at 0.1 or 0.3 mg/kg/min, corresponding to plasma levels of 2.5 ± 0.5 and 14 ± 2.5 μM, respectively (Table 3). The heart rate range was reduced by TROX-1 at 1 mg/kg/min (plasma level, 38 ± 4 μM); however, the average gain was not changed at this highest dose (Fig. 9B). Representative baroreflex curves showing the effects of GVIA and TROX-1 on rat baroreflex function. GVIA IV (3 μg/kg i.v.) decreased heart rate range and baroreflex sensitivity in an individual animal (A). TROX-1 (1 mg/kg i.v.) showed a modest effect on heart rate range only (B). Measurements were made before treatment (control; closed circles) and 30 min after treatment with GVIA (A; open circles) or TROX-1 (B; open circles). To further characterize the cardiovascular properties, TROX-1 was administered intravenously in sequential rising doses to anesthetized, vagotomized dogs (Table 4). At 1 mg/kg (administered over 30 min), there were no significant effects on MAP or heart rate compared with effects with vehicle alone. At 3 and 10 mg/kg (cumulative doses), TROX-1 dose-dependently decreased MAP (−10 and −25%) and heart rate (−16 and −20%). TROX-1 also slightly increased the PR interval (<9%) over the dose range, which may be secondary to the decrease in heart rate. There were no treatment-related effects on QRS or QTc cardiac intervals up to a maximal mean exposure of 55 ± 21 μM after the 10 mg/kg cumulative dose. Intravenous cumulative dose is measured in milligram per kilogram. The cardiovascular therapeutic window of TROX-1 was determined using the ratio of dog or rat cardiovascular side effect EC20/rat analgesic effect EC50. In the anesthetized dog cardiovascular studies, 20% change from baseline in heart rate and MAP corresponded to 55 and 40 μM, respectively (Fig. 8B). In rat baroreflex studies, heart rate range was only significantly reduced at the highest dose of 1 mg/kg/min, corresponding to plasma levels of ∼38 μM. Therefore, TROX-1 exhibited a cardiovascular therapeutic window of ∼38-fold. The present findings using the N-triazole oxindole TROX-1 show that an orally bioavailable, state-dependent Cav2 blocker is efficacious in preclinical pain models, while preserving normal neurologic and hemodynamic functions. The analgesic effects of oral doses of TROX-1 were established in several preclinical models of chronic pain in rats, including the CFA model of inflammatory pain and the intra-articular iodoacetate model of osteoarthritis, with efficacy similar to the anti-inflammatory agents naproxen, indomethacin, and diclofenac. TROX-1 was similarly active in the SNL (Chung) model of neuropathic pain, with efficacy similar to the analgesic agents pregabalin, which binds to the α2δ subunit of calcium channels, and duloxetine, which is a dual serotonin and norepinephrine reuptake inhibitor. The precise mechanisms by which the latter two therapies affect spinal neurotransmission are under active research (Tsukamoto et al., 2010, and references therein). TROX-1 analgesic activity was abrogated in mice deficient for Cav2.2, suggesting that its efficacy is derived primarily by block of Cav2.2 channels. At analgesic doses, TROX-1 produced no observable changes in motor coordination, cardiovascular function, or hemodynamic parameters. TROX-1 did induce mild impairments at 20- to 40-fold higher doses or plasma concentrations. These findings indicate that a state-dependent Cav2 blocker affords a substantially greater therapeutic window for neurologic and hemodynamic effects compared with ziconotide. State-Dependent Cav2.2 Channel Block Provides Functional Selectivity. Data from the present study demonstrate an increase in Cav2.2 channel density in the rodent lumbar spinal cord subsequent to an inflammatory pain state (Fig. 3), suggesting an enhanced role for Cav2.2 channels in inflammatory pain signaling. Similar results have been reported by studying a rodent neuropathic pain model using immunocytochemistry to measure Cav2.2 channel density after nerve injury (Cizkova et al., 2002). Both genetic and pharmacological data provide additional evidence that reducing Cav2.2 channel activity attenuates nociceptive signaling, but this also affects cardiovascular function. Cav2.2 knockout mice display reduced hyperalgesia in the CFA model (Fig. 4F) and reduced response to noxious mechanical, thermal, chemical and inflammatory visceral stimuli (Kim et al., 2001). Peptides, including GVIA, which block Cav2.2 channels in a state-independent manner (Dai et al., 2008), are active in reducing tactile allodynia and thermal hyperalgesia in a nerve injury model (Wang et al., 2000; Scott et al., 2002) and attenuate nociceptive responses in inflammatory pain models (Malmberg and Yaksh, 1995; Bowersox et al., 1996). These peptides inhibit excitatory synaptic transmission between primary afferent sensory neurons and superficial laminae dorsal horn neurons (Heinke et al., 2004; Motin and Adams, 2008), and they inhibit excitation of dorsal horn neurons by noxious sensory stimulation (Diaz and Dickenson, 1997). Data derived from Cav2.2 knockout mice and Cav2.2 blocking peptides have also provided evidence for important roles for Cav2.2 channels in cardiovascular functions. Cav2.2(−/−) mice display reduced atrial positive ionotropic responses to sympathetic stimulation; reduced baroreflex responses; and surprisingly, elevated mean arterial pressures and heart rates (Ino et al., 2001; Mori et al., 2002). Systemic administration of ziconotide, and related peptides that block Cav2.2 channels, also impair cardiovascular functions, including decreased mean arterial pressure, orthostatic hypotension, and attenuated baroreflex responses (Bowersox et al., 1992; Pruneau and Bélichard, 1992; Wright et al., 2000). State-dependent block of Cav2.2 channels by TROX-1 afforded a different in vivo profile than observed after state-independent channel block by peptides. TROX-1 provided clear antinociceptive activity in models of inflammatory and neuropathic pain, at plasma concentrations (EC50 = 1 μM) and doses (ED50 = 10 mg/kg p.o.) that did not cause significant changes in central nervous system (Rotarod) or cardiovascular functions. Concentrations of TROX-1 were similar in brain and plasma, indicating that the differential effects on nociceptive and other functions do not result from concentration differences in different tissues. Significant motor effects of TROX-1 were only observed at plasma concentrations above 20 μM, and cardiovascular effects were seen above 38 μM. The state-dependent nature of Cav2.2 block by TROX-1 may underlie the selective modulation of nociceptive responses compared with cardiovascular and motor functions. The activity of Cav2.2 channels will be governed by the local profile of electrical activity and by other regulatory processes and may differ across sites and physiological conditions. Depolarization or higher action potential frequencies may occur in sensory axon terminals after injury (Vyklický et al., 1969). Cav2.2 blockers that preferentially block open or inactivated channels could inhibit this enhanced nociceptive signaling, while preserving other neuronal functions. However, the precise relationship between the degree of state dependence for Cav2.2 block and the magnitude of the therapeutic window remains to be established. Implications of Nonselective, State-Dependent Block of All Cav2 Channel Subtypes by TROX-1. TROX-1 blocked calcium influx in DRG neurons that was mediated by a combination of all Cav2 channel subtypes, and experiments with recombinant Cav2.1, Cav2.2, and Cav2.3 channels revealed similar block of these channel subtypes by TROX-1 (manuscript in preparation). The roles of Cav2 channel subtypes have been examined using genetic and pharmacological approaches that often serve to completely abrogate channel function, or rely on human mutations for which the link between the mutations and the phenotypes are not fully understood. Cav2.1(−/−) mice die 3 to 4 weeks after birth and display ataxia, dystonia, absence seizures, cerebellar degeneration, decreased responses in inflammatory pain models, and altered sensory processing before death (Jun et al., 1999). A variety of human Cav2.1 mutations produce profound CNS effects, including episodic ataxia, and absence epilepsy (loss-of-function mutations), familial hemiplegic migraine and spinocerebellar ataxia (gain-of-function mutations) (Ophoff et al., 1996; Zhuchenko et al., 1997; Imbrici et al., 2004). Cav2.3(−/−) mice display a predominantly normal phenotype, with alterations in glucose metabolism and inflammatory pain responses (Cao, 2006). Injections of peptides into the CNS that block Cav2.1 and Cav2.3 channels produce some similar effects (for review, see Vanegas and Schaible, 2000). Despite nonselective block of all Cav2 subtypes, TROX-1 did not display the deleterious effects associated with Cav2.1 deletion in mice and mutations in humans. In fact, TROX-1 caused significant analgesic activity at 20-fold lower brain and plasma levels than were required to induce significant impairment of motor coordination in the Rotarod test. We hypothesize that the lack of effect of TROX-1 on motor coordination at concentrations that produce analgesia might result from state-dependent block of Cav2 channels in a manner that preferentially affects channel activity in pain signaling pathways. Cav2.1 currents expressed in cerebellar Purkinje neurons, as well as certain recombinant Cav2.1 splice variants, are less inactivating than other Cav2 family members (Mintz et al., 1992; Bourinet et al., 1999) and may therefore have reduced sensitivity for block by state-dependent blockers such as TROX-1. The clinical validation of Cav2.2 as a target for the treatment of chronic, severe pain has been established with the approval of ziconotide. This discovery has sparked great interest in exploiting the full potential of this novel mechanism (for review, see Miljanich, 2004). Indeed, ziconotide provides pain relief to many people for whom there are no other treatment options. The development of an orally bioavailable, Cav2.2 blocker with an improved therapeutic window would be another milestone in the treatment options for debilitating pain. There have been several previous reports concerning the identification of novel, small organic molecules that block N-type channels and exhibit analgesic and other activities in rodent models (for review, see Yamamoto and Takahara, 2009). Structurally, there seems to be a wide range of permissive pharmacophores that can functionally interact with the N-type channel complex, including dialkyl-dipeptidylamines, substituted amino acids, imidazolines, saturated and unsaturated hydrocarbons, dihydropyridines, 4-aminopiperidines, and disubstituted piperazines (Yamamoto and Takahara, 2009). TROX-1 compares very favorably with these other agents in exhibiting state-dependent Cav2 blockade, being both orally available and brain-penetrant; possessing minimal activity against non–Cav2 ion channels and other nonspecific molecular and physiological targets; and showing broad-spectrum analgesic efficacy in wide range of rodent models of chronic pain with efficacy equivalent to pregabalin, duloxetine, and naproxen. This is the first study demonstrating that a state-dependent Cav2 blocker affords a therapeutic window over cardiovascular and CNS side effects. Overall, the data reported concerning TROX-1 support the notion that an orally administered, state-dependent Cav2 blocker may achieve a therapeutic window suitable for the treatment of pain in the clinic. We thank L. Gichuru, X. Li, A. M. Ritter, and K. Villa for outstanding technical expertise. We also thank K. Rogers and A. Weber for scientific guidance. (1999) Splicing of alpha 1A subunit gene generates phenotypic variants of P- and Q-type calcium channels. Nat Neurosci 2:407–415. (1996) Selective N-type neuronal voltage-sensitive calcium channel blocker, SNX-111, produces spinal antinociception in rat models of acute, persistent and neuropathic pain. J Pharmacol Exp Ther 279:1243–1249. (1992) Cardiovascular effects of omega-conopeptides in conscious rats: mechanisms of action. J Cardiovasc Pharmacol 20:756–764. (2006) Voltage-gated calcium channels and pain. Pain 126:5–9. (2002) Localization of N-type Ca2+ channels in the rat spinal cord following chronic constrictive nerve injury. Exp Brain Res 147:456–463. (1987) Evidence that adjuvant arthritis in the rat is associated with chronic pain. Pain 28:201–222. (2008) A high-throughput assay for evaluating state dependence and subtype selectivity of Cav2 calcium channel inhibitors. Assay Drug Dev Technol 6:195–212. (1997) Blockade of spinal N- and P-type, but not L-type, calcium channels inhibits the excitability of rat dorsal horn neurones produced by subcutaneous formalin inflammation. Pain 69:93–100. (2003) Molecular pharmacology of high voltage-activated calcium channels. J Bioenerg Biomembr 35:491–505. (1992) Molecular cloning of the alpha-1 subunit of an omega-conotoxin-sensitive calcium channel. Proc Natl Acad Sci USA 89:5058–5062. (1996) Differential regulation of evoked peptide release by voltage-sensitive calcium channels in rat sensory neurons. Brain Res 712:265–273. (1988) Evidence for distinct sites coupled to high affinity omega-conotoxin receptors in rat brain synaptic plasma membrane vesicles. Biochem Biophys Res Commun 154:298–305. (2004) Pre- and postsynaptic contributions of voltage-dependent Ca2+ channels to nociceptive transmission in rat spinal lamina I neurons. Eur J Neurosci 19:103–111. (2004) Dysfunction of the brain calcium channel CaV2.1 in absence epilepsy and episodic ataxia. Brain 127:2682–2692. (2001) Functional disorders of the sympathetic nervous system in mice lacking the alpha 1B subunit (Cav 2.2) of N-type calcium channels. Proc Natl Acad Sci USA 98:5323–5328. (1999) Ablation of P/Q-type Ca(2+) channel currents, altered synaptic transmission, and progressive ataxia in mice lacking the alpha(1A)-subunit. Proc Natl Acad Sci USA 96:15245–15250. (2001) Altered nociceptive response in mice deficient in the alpha(1B) subunit of the voltage-dependent calcium channel. Mol Cell Neurosci 18:235–245. (1982) Purification of cardiac sarcolemmal vesicles: high sodium pump content and ATP-dependent, calmodulin-activated calcium uptake. J Biochem 91:1419–1426. (1979) A method for the analysis of sigmoid stimulus-response curves. Aust J Exp Biol Med Sci 57:39–41. (1995) Effect of continuous intrathecal infusion of omega-conopeptides, N-type calcium-channel blockers, on behavior and antinociception in the formalin and hot-plate tests in rats. Pain 60:83–90. (2004) Ziconotide: neuronal calcium channel blocker for treating severe chronic pain. Curr Med Chem 11:3029–3040. (2002) Ca(2+) channel alpha(1B) subunit (Ca(V) 2.2) knockout mouse reveals a predominant role of N-type channels in the sympathetic regulation of the circulatory system. Trends Cardiovasc Med 12:270–275. (2008) omega-Conotoxin inhibition of excitatory synaptic transmission evoked by dorsal root stimulation in rat superficial dorsal horn. Neuropharmacology 55:860–864. (1998) Selective peptide antagonist of the class E calcium channel from the venom of the tarantula Hysterocrates gigas. Biochemistry 37:15253–15362. (1994) Calcium channel diversity and neurotransmitter release: the omega-conotoxins and omega-agatoxins. Annu Rev Biochem 63:823–867. (1992) Haemodynamic and humoral effects of omega-conotoxin GVIA in normotensive and spontaneously hypertensive rats. Eur J Pharmacol 211:329–335. (2002) Actions of intrathecal omega-conotoxins CVID, GVIA, MVIIA, and morphine in acute and neuropathic pain in the rat. Eur J Pharmacol 451:279–286. (2010) Spinal mechanism of standard analgesics: evaluation using mouse models of allodynia. Eur. J. Pharmacol. 634:40–45. (1969) Primary afferent depolarization evoked by a painful stimulus. Science 165:184–186. (2000) Interactions of intrathecally administered ziconotide, a selective blocker of neuronal N-type voltage-sensitive calcium channels, with morphine on nociception in rats. Pain 84:271–281. (1992) Structure and functional expression of an omega-conotoxin-sensitive human N-type calcium channel. Science 257:389–395. (2005) Use-dependent blockade of Cav2.2 voltage-gated calcium channels for neuropathic pain. Biochem Pharmacol 70:489–499. (2000) Postural hypotension following N-type Ca2+ channel blockade is amplified in experimental hypertension. J Hypertens 18:65–73. (2009) Recent updates of N-type calcium channel blockers with therapeutic potential for neuropathic pain and stroke. Curr Top Med Chem 9:377–395. (1997) Autosomal dominant cerebellar ataxia (SCA6) associated with small polyglutamine expansions in the alpha 1A-voltage-dependent calcium channel. Nat Genet 15:62–69.